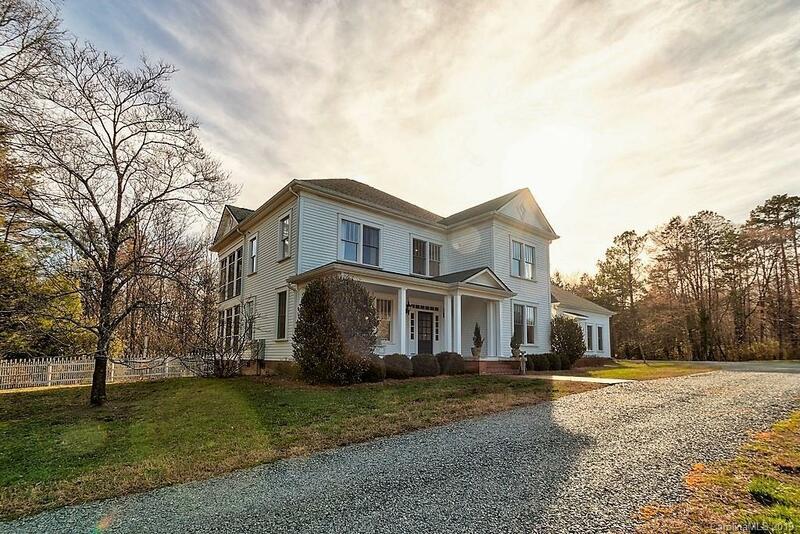 Almost ten acres with pastures, barn, hardwoods, scenic pond, and a custom designed and built home located in one of the regions’ most desirable areas, should qualify as the “best of all possible worlds”. We admit taking some liberties with the phrase first coined at the beginning of the 18th century by the German philosopher Gottfried Leibniz while addressing the question of theodicy. The topic was famously addressed again in 1759 by the French philosopher, Voltaire in his novella, Candide, considered by many to be one of the 100 most influential books ever written. Still, the phrase is most applicable to 3224 Northwinds Drive, Waxhaw, NC. Located near the quaint village of Waxhaw, in the highly desirable Marvin school district, this well-conceived and exceptionally maintained farm is private, yet minutes away from urban conveniences; including a location near the Waxhaw Swim and Tennis Club; it is the best of all possible worlds. The home was designed and built using homes in Charlotte’s historic Elizabeth neighborhood as models. The current owner’s fond memories of her grandparent’s home in Elizabeth inspired her year-long design process. With architect and builder in tow, she visited homes in Elizabeth and poured over photos of homes in the historic neighborhood seeking a design mimicking those period homes, yet with all the modern conveniences. A historic restoration trim carpenter was engaged to create custom period trim; the front door was modeled after the front door of an original Sears’ Craftsman house, now home to a garden center in the Elizabeth area. Landscaping design was based on that of 1930’s homes. Loving memories inspired a home specifically designed to conjure images of a warm, family lifestyle. Enter the front door from the covered front porch, to a large central hall accessing all living spaces. Both the living room and master suite open to the hallway leading to the kitchen and dining space, as does the stairway leading to the second floor living space and on to the 3rd floor bonus room. High ceilings, hardwood floors, crown molding, custom trim work, transoms, French doors and oversized windows are but some of the special touches in this well-conceived home. Views of the property are plentiful with the placement of windows, adding to the indoor-outdoor sense intended. The living room with fireplace is one of several places ideally suited for relaxation, including a siting room on the second floor situated between three guest bedrooms, each with its own bathroom. An efficient, gourmet kitchen with breakfast bar melts into the dining space, both featuring a “wall of windows”, offering views of the landscaped back yard. It is here we find the first of two (2) screened porches, inviting the outside indoors. This home is not only attractive but also functional. One demonstration of that functionality is an oversized mud room/laundry connecting the kitchen and the 3-car, side-loading garage. In addition, the spacious garage has an abundance of floored storage space overhead. Your family or guests will be treated to privacy in the three (3) upstairs bedrooms and the common sitting room. Each bedroom has its own bathroom and walk-in closet. Once again, the outside is invited in by a second-floor screened porch with fireplace. This porch is accessible from one bedroom and the sitting room. The home interior is completed with a third floor, finished bonus room, ideal for numerous uses. The farm is currently an equestrian farm with front pastures and riding arena. The pastures are connected by a fenced path to a barn situated among the hardwood in the rear of the property. The barn is flexible in design, allowing for 3-5 stalls and including a walk-up hay loft with drop, concrete wash stall, hot and cold water, tack room, shop and equipment storage. This special location includes an idyllic stocked pond, English garden courtyard, vegetable garden with stone paths and mature landscaping. 3324 Northwinds Drive, your own estate located in Waxhaw; the best of all possible worlds.